What is it going to take for the public to realize they have not only been screwed…..but no one even bothered to use vaseline. Everyone associated with this fake shooting scenario should be arrested and perp walked right off to prison. Boston was supposedly conducting a bomb drill…….a drill which just incidentally coincided with the finish of the Boston marathon. 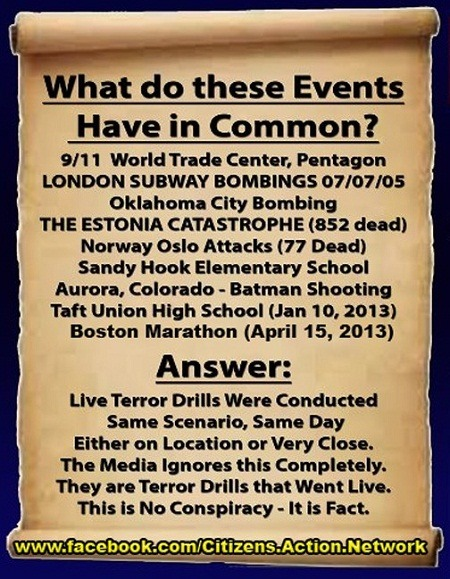 Strange how these drills just seem to coincide with “terrorist” attacks. What luck! Time after time…..drills are conducted based on the exact same events that occur at exactly the same time. This time around, instead of seizing everyone’s video camera’s, phones and other devices, the authorities are asking people to give them videos they may have. This way, as much evidence as possible can be gathered……..and destroyed??? At first it was reported that 14 people were injured and that three people were dead. Now three people are still dead including one eight year old boy. And the number of injuries has jumped to 140. We also went from schrapnel wounds to severed limbs lying about. And of course Obama claimed this is all the more reason why the gun bills aimed at dis-assembling the 2nd Amendment must be passed quickly. About That 9/11 Terrorist Attack . . .
September 11, 2012 – It is not even noon and I am already so full of ‘tributes’ and ‘remembrance’ of “9/11” that I could vomit. Someone on the news took it upon themselves to point out the importance of teaching this load of crap to the younger generation. After eleven years, why do we see no credible explanation of how the towers collapsed, at 8:46 and 9:03, into their own footprints? When did temperatures from the burning jet fuel (500-599 °F) reach high enough to melt steel (2,070 °F)? At 9:37 Flight 77 (or something) crashes into the western side of the Pentagon at 530 mph and starts a violent fire. Why has no picture of the wreckage of this airliner ever been published? At 10:03 United Airlines Flight 93 is crashed by its hijackers and passengers at 583 mph, due to fighting in the cockpit 80 miles southeast of Pittsburgh in Somerset County, Pennsylvania LEAVING A DEBRIS TRAIL MORE THAN A MILE LONG. Oh, and what caused Building 7 to fall at 5:20 p.m. INTO ITS OWN FOOTPRINT. On 9/11 the world’s only military superpower was apparently oblivious to the location of rogue airliners in its airspace for over an hour, and military commanders were left perplexed on how to deal with the situation of hijackers using these planes as flying bombs. This confusion resulted in fighter jets flying around aimlessly whilst the hierarchy fully assessed what was going on, and this total lack of cohesion ultimately led to the loss of nearly 3000 lives. 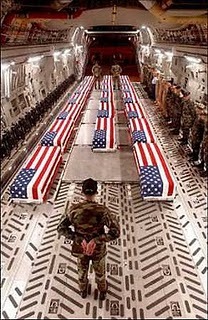 All that was required to overcome America’s military might on 9/11 were 19 hijackers on 4 airliners. Does this sound plausible to you? It is what you are expected to believe. There is, believe it or not, a limit to how far my credulity can be stretched. Let’s define what is probably going on. 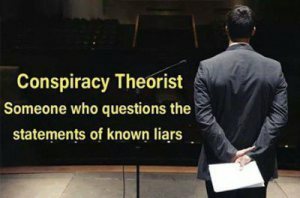 False flag (also known as black flag) operations are covert operations designed to deceive in such a way that the operations appear as though they are being carried out by other entities. The name is derived from the military concept of flying false colors; that is: flying the flag of a country other than one’s own. 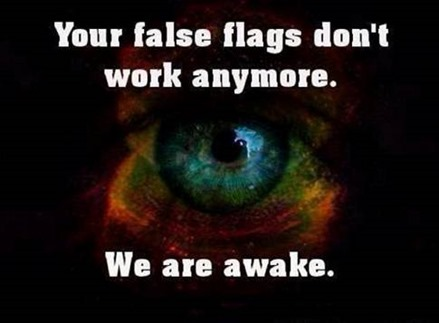 False flag operations are not limited to war and counter-insurgency operations and can be used during peace-time. Have you ever read a single word about the Holocaust without a mention of Adolph Hitler’s government, then in power? The second Tonkin Gulf incident was originally claimed by the U.S. National Security Agency to have occurred on August 4, 1964, as another sea battle, but instead may have involved “Tonkin Ghosts” (false radar images) and not actual North Vietnamese Navy torpedo boat attacks. In 2005, an internal National Security Agency historical study was declassified; it concluded that the Maddox had engaged the North Vietnamese Navy on August 2, but that there were no North Vietnamese Naval vessels present during the incident of August 4. The outcome of these two incidents was the passage by Congress of the Gulf of Tonkin Resolution, which served as President Johnson’s legal justification for deploying U.S. conventional forces and the commencement of open warfare against North Vietnam. Before we take it upon ourselves to pass along all of this ‘lore’ to our children, why don’t we hear from those closest to the carnage and devastation we commemorate today – who know what really happened on September 11, 2001. Saturday night, a joint “anti-terrorism” task force composed of the FBI, Department of Homeland Security and local law enforcement descended upon a Christian Militia group known as Hutaree near the town of Adrian, Michigan. Seven people have been arrested and are scheduled to be brought before the U.S. District Court in Detroit on Monday. When I first heard the news of the Haitian earthquake and, especially when the media and the military rolled out their full-blown response to it within hours of its happening, my first suspicion was that the Department of Defense had deliberately caused the quake using the weapon of mass destruction known as HAARP. Admittedly, even I thought I’d be rash to say so publically, since the vast majority are unaware of the existence of HAARP, let alone what it is capable of.